Calling all superheroes! We’re pulling out all of our super powers to bring you the best Spiderman Birthday Ideas! What little one doesn’t love Spiderman, right?! 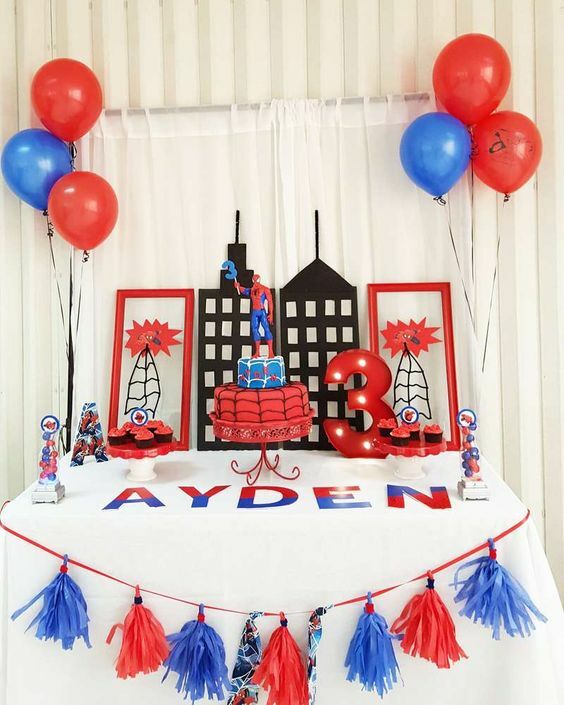 If your child wants a super cool Spiderman party, here are 21 Spiderman Birthday Party Ideas that are full of creative inspiration for cakes, decorations, party favors, party games, invitations, and more! You will be putting together a Spiderman party like a pro in no time with these fun ideas! The Amazing Spiderman is one of the most beloved superheroes around. His cool costume plus his awesome adventures makes him a huge hit among children and adults alike. No wonder so many kids ask for a birthday party featuring Spidey! Check out the awesome Spiderman party ideas below to get your little one’s Spiderman themed birthday party started. 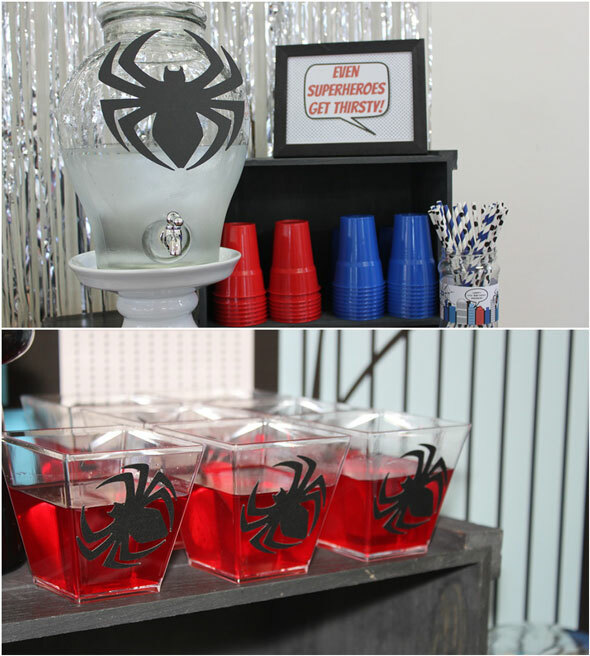 Spidey Party Idea #1: Did you know even superheroes get thirsty?! Set up a fun Spiderman Beverage Station like the one above for all of those little superheroes. Setting this drink station up is super easy. Just print out a spider outline, trace it on black cardboard and stick them on your drinks! Spidey Party Idea #2: Looking for a fun game for your little party guests to enjoy? 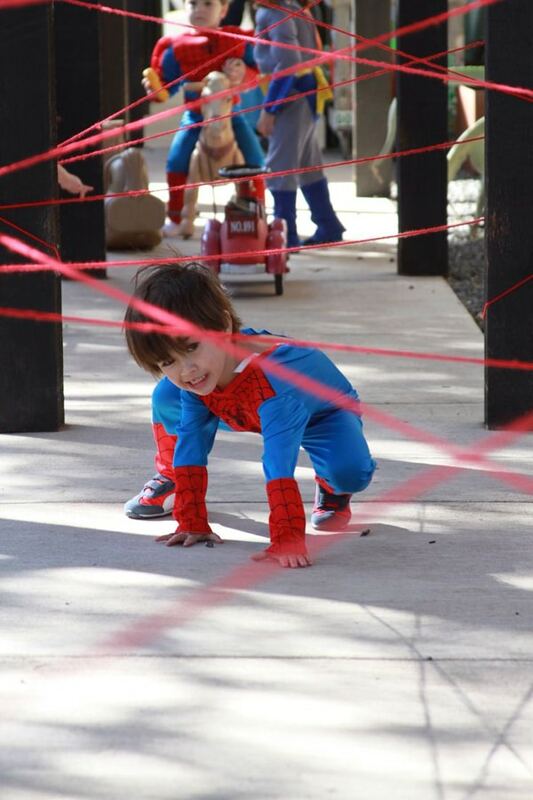 Some string is all you need for this clever Spiderman Party Game Idea! Tie some red strings across a couple of posts and let your little ones dodge the strings as they get from one side to another. This party game will surely be a huge hit! 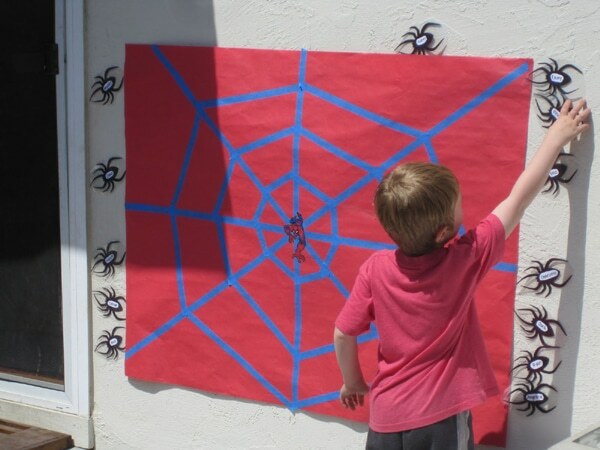 Spidey Party Idea #3: Another way to keep the kids entertained is with this Pin the Spider on the Web game. It’s pretty easy to DIY. All you need is a red backdrop with a spiderweb and a couple of spider printouts. You can even get your little one to help you and make it your own little craft project. 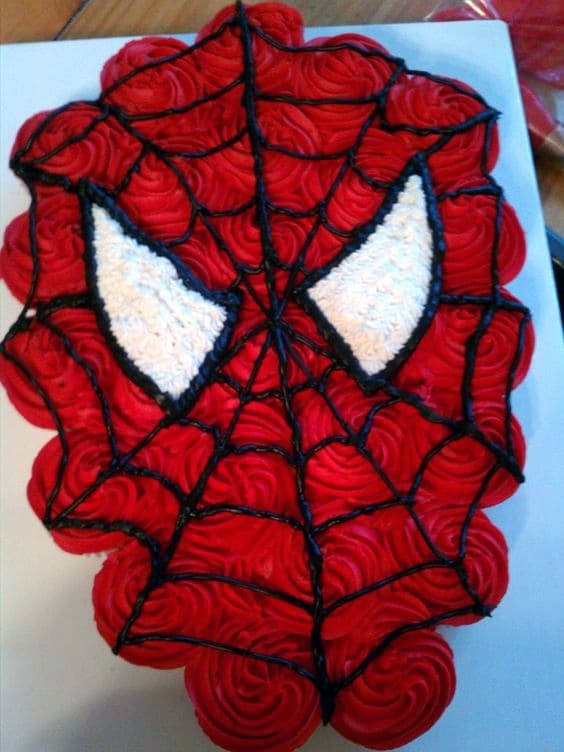 Spidey Party Idea #4: Need clever ideas on how to make a spiderman cake? How about this awesome number? This Spiderman Birthday Cake is perfect for any child’s party. 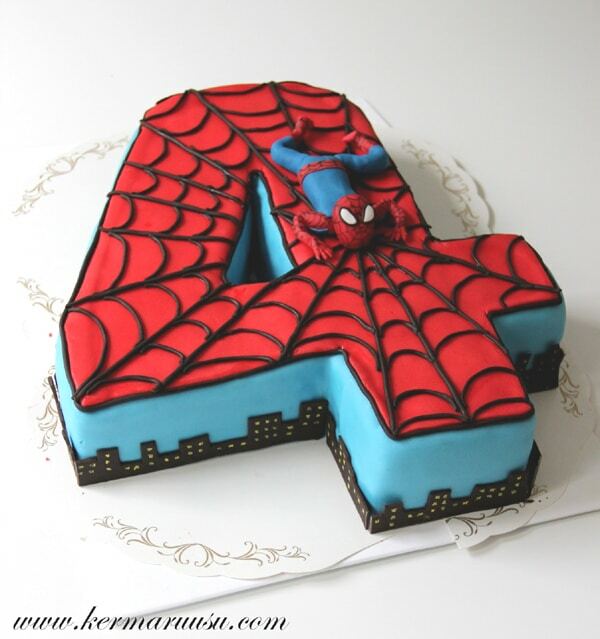 A number cake with Spiderman on top will definitely be a hit! The side decor with the little buildings all lit up are a great addition for this cake, and don’t forget the cute crawling Spiderman on top! 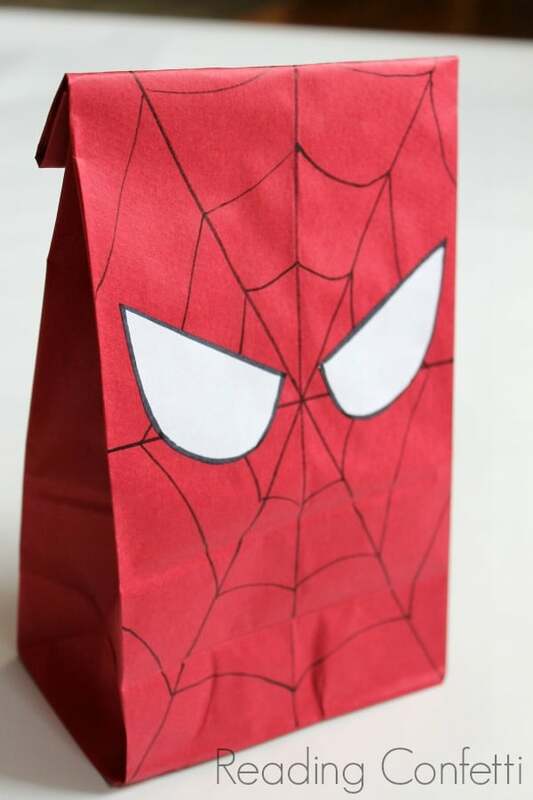 Spidey Party Idea #5: Make these DIY Spiderman Favor Bags for the kids to take their goodies home. These awesome candy bags are pretty cheap and easy to DIY, but they sure make a great addition to your Spiderman birthday theme. To make these bags, you can get cheap red lunch bags and use a black marker to make the web plus some white paper for the eyes. Easy peasy, right? 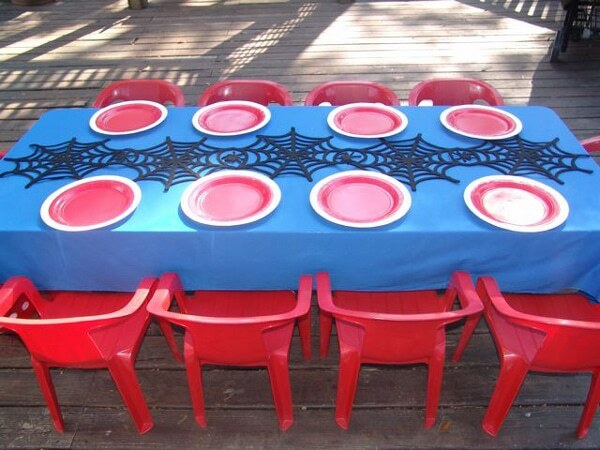 Spidey Party Idea #6: This Spiderman Party Table is easy to put together. Just look for some black spider web decorations around Halloween time. Of course, don’t forget about the red and blue! It’s what makes Spiderman’s costume memorable after all. Spidey Party Idea #7: How cool are these Spiderman Candy Apples?! Serve them at your party on the dessert table or wrap them up as party favors for the kids to take home! These will definitely go out fast at your party. Spidey Party Idea #8: Here’s an awesome Spiderman Dessert Table idea that’s easy for anyone to put together. We love the red number marquee sign on the table! Even without Spiderman everywhere, it’s easy to make your party look Spidey-themed just by adding a couple of red, blue, and black homemade party decorations. 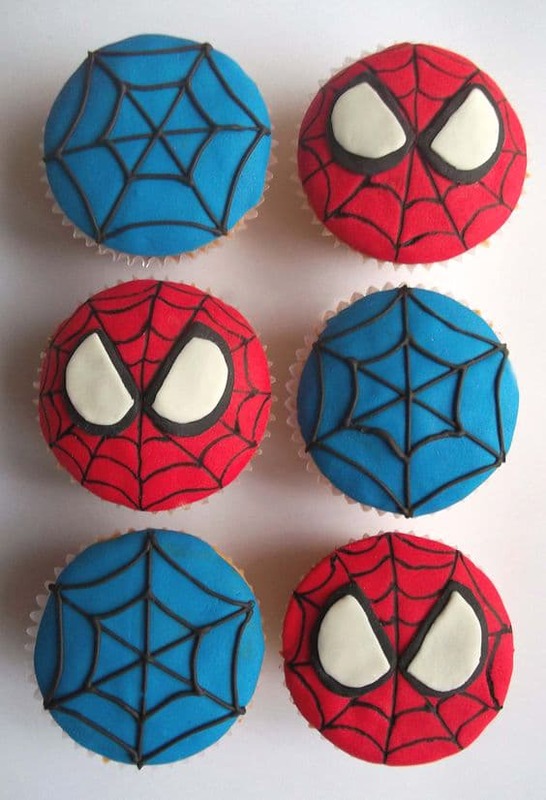 Spidey Party Idea #9: Any mom can make these fun Spiderman Cupcakes! They don’t call you Super Mom for nothing, right?! They make for great party food ideas too because they’re easy to eat for little ones! Spidey Party Idea #10: Looking for some Spiderman cake ideas? 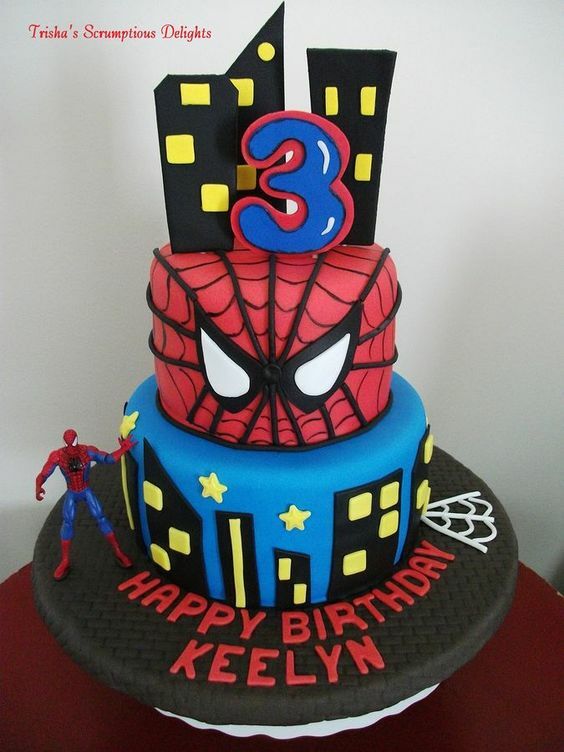 WOW, this Spiderman Party Cake is perfect for any little superhero! If you’re looking for cake centerpieces that will really amaze your guests, then this tiered cake is definitely on top of the list. This tiered cake looks a bit challenging to bake yourself, but what better time to test your baking skills? You’ll have lots of fun making this cake for sure! Spidey Party Idea #11: Every superhero needs a cape! 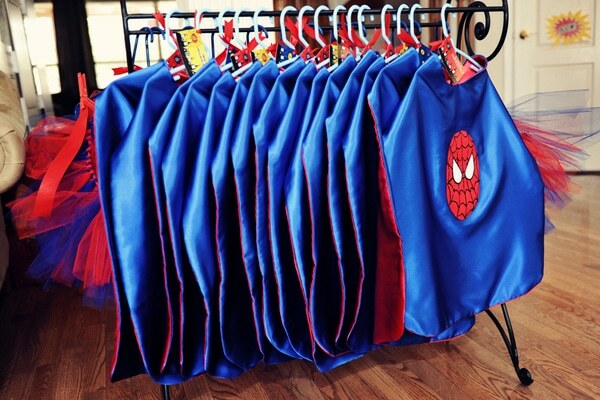 Check out these awesome Spiderman Party Favor Capes! If you can’t find any capes, you can also give out a Spiderman shirt as a part favor. These are pretty easy to find, and kids will definitely love them. Plus, they can be worn over and over again, so parents will appreciate them too! Spidey Party Idea #12: Wan’t something healthy to give your guests’ teeth a break from all the yummy sweets? 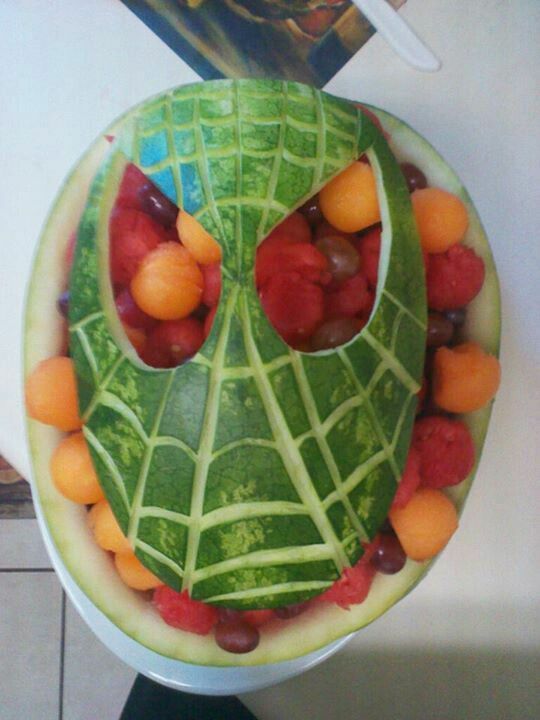 This Spiderman Watermelon Fruit Display will certainly turn heads at your party! What a fun and creative fruit display! Carving the Spiderman mask on the surface of the watermelon would probably be a bit challenging, but the end result definitely looks super amazing! 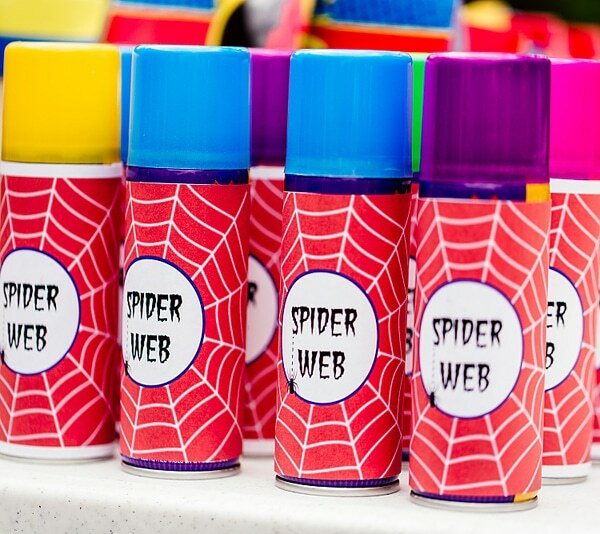 Spidey Party Idea #13: Get some silly string and name it Spider Web Spray! The kids will have a blast spraying each other at the party! Nothing says happy birthday Spiderman like having some fake spiderwebs around! All you need for these are some printed spider web labels, and you’re good to go! 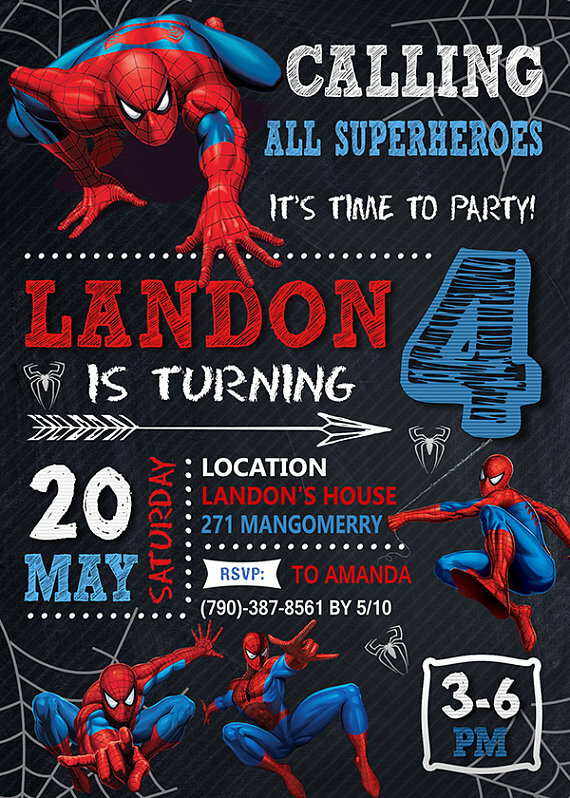 Spidey Party Idea #14: Now this is a great Spiderman Party Invitation for your little superhero’s party! It’s fun and lively, and it covers all the details too! If you’ve got great design chops, you can also create your own custom Spiderman invitations and just print them out at home, but this should give you some good ideas! 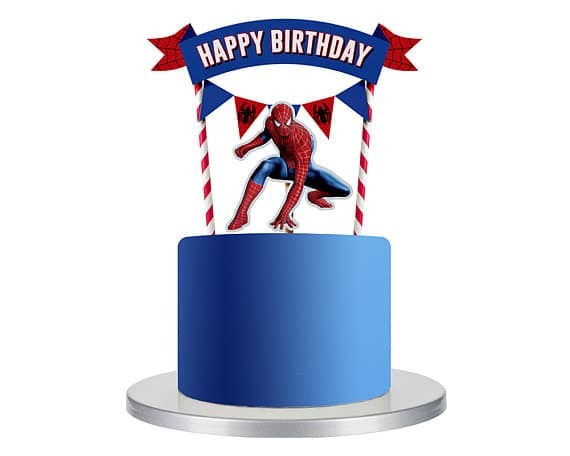 Spidey Party Idea #15: Dress up your birthday cake with this Spiderman Cake Topper! It’s even complete with a red and blue birthday banner! If you don’t have the time or budget for a super complicated Spiderman cake, then you can just get a regular cake and add this cake topper. It’ll be a nice addition for your dessert table! 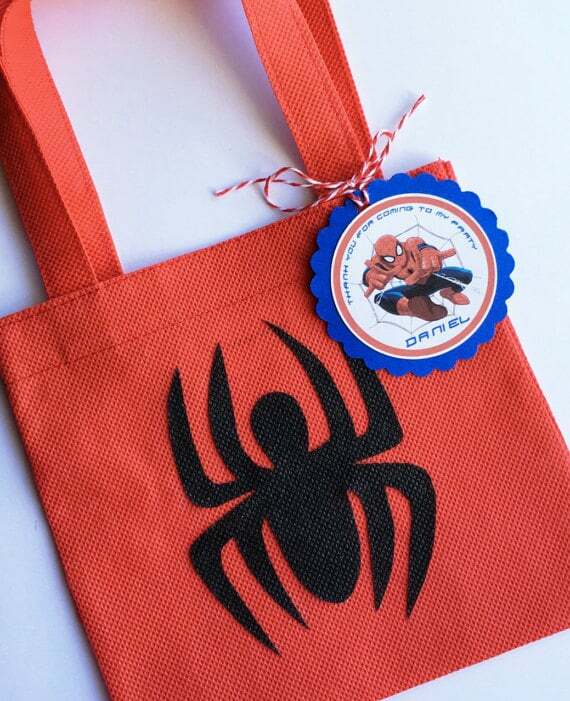 Spidey Party Idea #16: We just love these adorable Spiderman Party Favor Bags! They are quite easy to DIY too. Just get some of those small cloth shopping bags, cut out some spider outlines on black felt paper and stick them on the bags. This one’s also got a nice custom tag too! 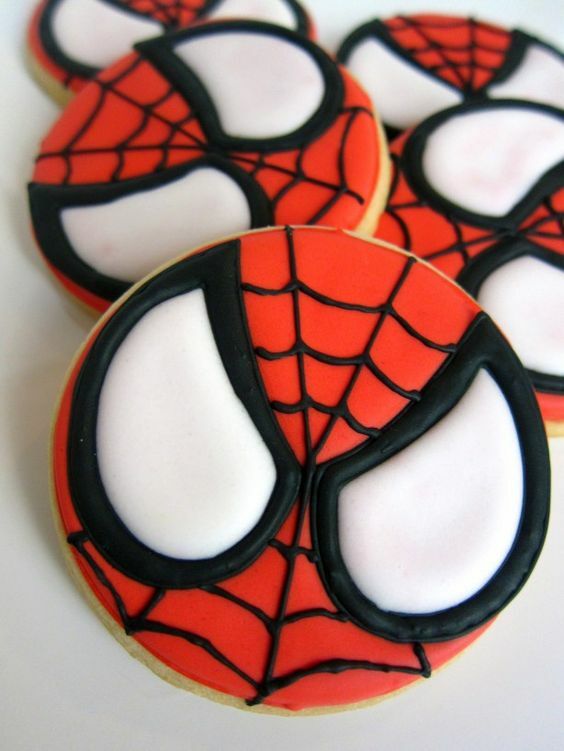 Spidey Party Idea #17: These Spiderman Cookies would look awesome next to your cake and other desserts on your sweets table. You’ll definitely have fun decorating these cookies. You can use your typical sugar cookie recipe and some red, black, and white icing to decorate. Want to have even more fun? Invite the kids to join in when you’re decorating! Cookie decorating stations are always a fun idea at a birthday party! Spidey Party Idea #18: You can never go wrong with a Spiderman Cupcake Cake! What’s great about having a cupcake cake is that it makes for an awesome dessert table centerpiece, but you don’t have to worry about cutting it later. Your party guests can just take a piece anytime! You can also make simple cupcakes topped with just red and blue icing so that you will never run out of cupcakes for your guests. 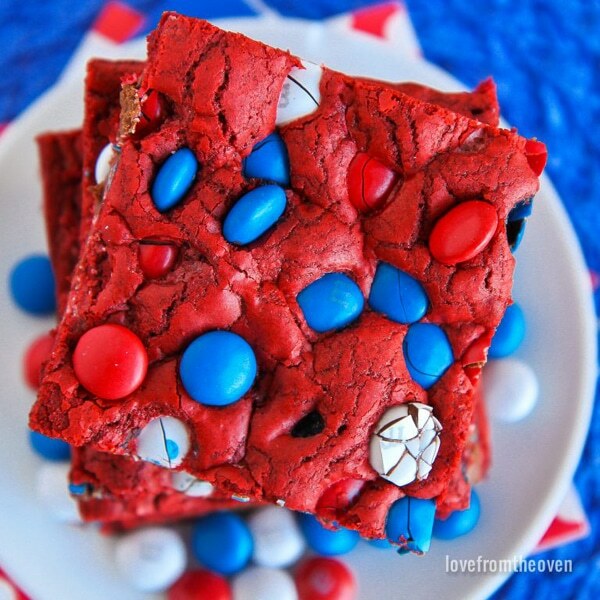 Spidey Party Idea #19: These Red, White and Blue Bars will be a party favorite, and they are even Spiderman colors! You can use any recipe for these bars, so consider making a couple different flavors to suit each of your guests’ preferences! You can have brownies, lemon bars, oatmeal bars, M&M bars like these ones, peanut butter bars, and so many more! 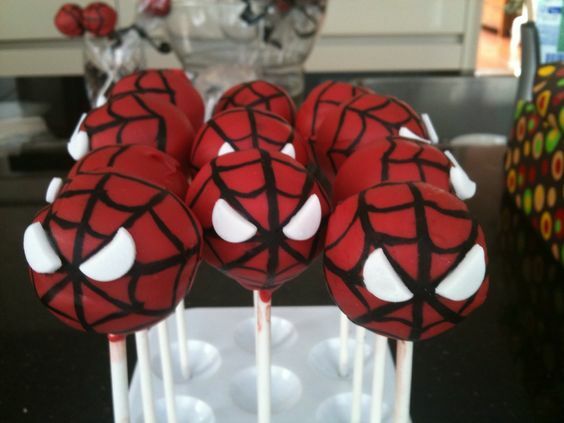 Spidey Party Idea #20: Your dessert table definitely needs some fun Spiderman Cake Pops! These super cute Spidey cake pops will make a great addition for your table and look great next to your cake centerpiece! 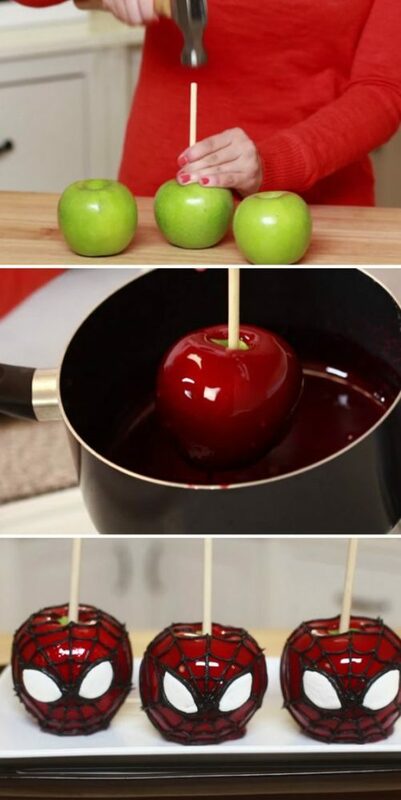 Cake pops are a lot easier to make than a huge tiered cake too, so you can easily make these at home. 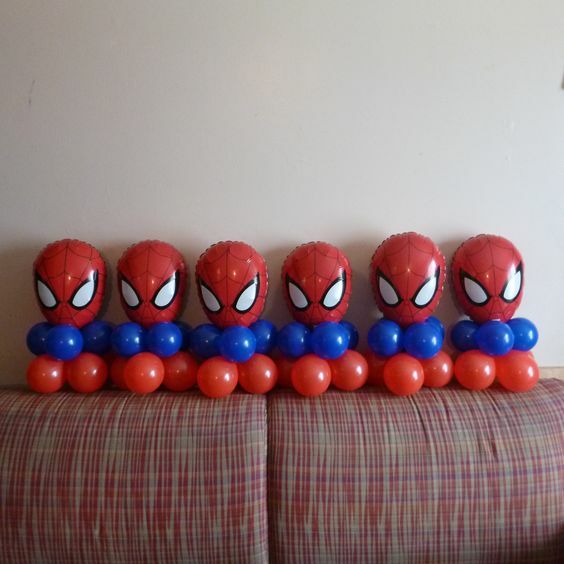 Spidey Party Idea #21: The kids will definitely be talking about how cool these Spiderman Balloons are! The Spiderman head balloons are easy to find online or at any party store, and of course, you can get red and blue balloons anywhere to make them look even cooler. Aside from being awesome decorations, these will make for great party giveaways too! Your children’s friends will definitely love taking these home. Which of these 21 Spiderman Birthday Party Ideas will you do for your child’s party? Let us know in the comments below! Looking for more party ideas? Don’t forget to follow us on Instagram @prettymyparty and Pinterest and join us in our private Facebook group.